If you sell handmade clothing or accessory items, labels are a necessity. Not only because it is good branding practice to attach your company information to anything that you sell, but also because it is the law that you include information about the origin, content, and care of your products on an attached label. Even for the little guy or girl with a small indie business, the US Federal Trade Commission requires that you declare certain information in the form of a label on your clothing, fashion accessories, and some other handmade items. Most beginning artists and crafters don't realize this at first, but it is important to know the laws and regulations pertaining to what you are selling - labeling is just one. I am not going to go into details of what is and is not required to be on a label because it can vary. Instead, I'm providing several links for you in my resource information below. Please read for yourself what is required specifically on your own product labels. After realizing that I needed to label my handmade felted wool items, I researched what was necessary to include on those labels for my personal items. Then I proceeded to research how to make labels and where to buy already made labels. There are many options for labeling your handmade items. You can make labels yourself. You can purchase labels from another handmade artisan such as those found on Etsy. Or, you can buy professional quality woven labels from a manufacturer online or locally. The choice is up to you. I initially had chosen to make my own labels, but eventually I plan to invest in some professional quality woven labels for my felted fashion accessories. Since many beginning artist and crafters are on a tight budget, the do-it-yourself method for label-making is usually the best route for a crafty person. Below are some basic instructions on how I have made my own sew-in labels. There are many other ways to make your own labels so check my resource information for some helpful links. And, if you have the cash and aren't feeling crafty about label-making, then purchase some from a handmade artisan or from an online company. You'll find suggested sources in my resource information below. computer, inkjet printer, scissors, a ruler, a table top work space, an iron, a pillow case to lay on the ironing surface, about a yard of thick cotton fabric or cotton canvas material, and machine washable dark t-shirt transfer paper. *You will also need a graphic image and/or text information to put on your label; you can do this yourself via a computer or buy a design off Etsy (see resources). 2. Once you have your file page of labels ready to print, you will need to have an inkjet printer handy along with your dark t-shirt transfer paper (as seen in the photo). Simply print your page of labels onto the dark t-shirt transfer paper by following the instructions given on the transfer paper's packaging. 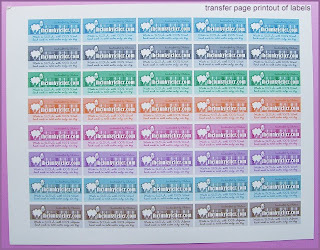 Since the transfer paper is pricey, you might want to only print one sheet at first and follow-through all the instructions to see how the labels turn out. 3. After you've printed a page of labels on the transfer paper. 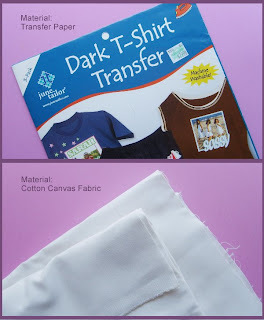 Follow the instructions on the transfer paper's packaging to iron it on to the thick cotton material or cotton canvas (as seen in the photo). I suggest that you cut your fabric to the size of the transfer page prior to ironing it on to make it easier to handle during the process. 4. Once you've ironed the transfer page onto the fabric according to the transfer paper's packaging instructions, let it sit for a few minutes to cool. Then you can remove the parchment paper backing before cutting out your labels. Once your labels are cut out, you can sew them onto your items. If you'd prefer an even easier way to make labels...... you can use a customized stamp, fabric ink, and ribbon. Simply ink up your customized stamp and put it on cut sections of ribbon. You can then sew the ribbon in as a label. **Please note that I, the funky felter, am not affiliated with any of the suggested label sellers, nor do I endorse or recommend their services. I am simply providing their links as resources for you to evaluate. Thanks for all the great information. I was reading a forum on Etsy recently on this topic. I realized the requirements for labelling clothing, but hadn't generalized to my other felted items. Looks like I need to make some changes. You are an amazing talented walking dictionary. Thank you. I wish I had talked to you before my pattern fiasco. I love the colour choice on your labels... they look great. Thanks for the info too. 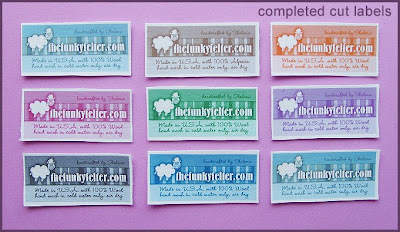 I use Woven Labels UK... they are quick, helpful and have a great quality. Thanks for this! I buy my labels from Sugar Plum Baby and they do a great job but I love the idea of making my own. What a great post! So much information that one needs to know and sometimes is not aware of. Ive been looking into labels, I didn;t know it was the law, I just thought I should do something like that. I wanted to do them myself and this was a great tutorial! Thanks! Great looking labels! Thanks for sharing all this useful information. Really good info. I'm ready to make my labels. You can also get help with a firm I used to make very low quantities. I was able to put my grandmother's wedding picture on some labels for quilts. A Picture! awesome, thanks! does the transfer paper make the label stiff or itchy? i'll be using these on clothes..thanks! The labels are so cute. I think my wife is going to love those cute labels. I need to show this to her. I really love the sheep character in that label. Great idea to use a stamp and ribbon to make a label. Awesome read! Thank you so much, the information about labels, make my day, links are great! Hello! I love your blog! I've been looking for a way to make labels for my crocheted items, but I never knew there was so much legal information to it! *whew! * lol. I tried going to the first US Label Law Information link you provided (Threading Your Way Through the Labeling Requirements Under the Textile and Wool Acts from FTC.gov) and it says the link is not found. Thanks for taking the time to compile such a great list of resources and tutorials to share! This is really wonderful! I really like the design of those customized labels. Definitely perfect for DIY projects and for presents, too. I am really thankful that I found your blogs. Thanks for sharing this and more power to you!